I have seen quite a few extravagant birthday parties in my day. My family always went above and beyond…we were the kids that always had a moon bounce at our house and parties that never seemed to end. One birthday I even had an Olympic Swimmer come talk to me and my friends about goals. Yes, my family is a bit crazy, but this is not new news. So the point is, with birthdays, we have seen it all. And yet, a few weekends ago I experienced something I could hardly fathom. My friend Kate – that is really all I have to say if you know her. She amazes me daily. 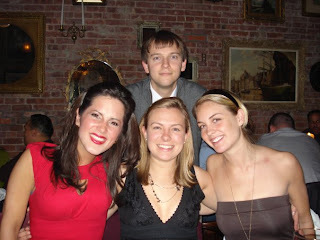 Well, Kate and her roommate Elizabeth and their friends who all live and work in DC decided to have their birthday in New York. What an incredible idea! What amazes me about all of this is that Mark and I participated. We drove from DC to New York and back again, all for a birthday dinner. The entire car ride up, (which is really not a bad trip) we kept saying, are we really doing this? The great part about it all is that it gave us a perfect reason to crash with Katie Mac and spend some quality girl + Mark time. Mark has a way of realizing when Katie and I need to see each other. I am working too hard and she is studying too hard and spending time together is rejuvenating. Mark understands this and caters to us accordingly. He has taken the two of us for a girls day at the spa, secretly brought Katie to Boston when I was super stressed, and this weekend, treated us like royalty as always. Our weekend was filled with food and naps, and then more food. We had lunch on Saturday at a cute little place called Out of the Kitchen. It was soooo good! 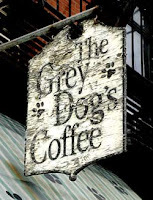 Then it was time for coffee at Grey Dog. Our drinks were delicious and Grey Dog was the perfect place to sit before we headed back to Katie’s apartment for a long afternoon nap. Then it was time for Kate and Elizabeth’s birthday dinner! We ate at the Antique Garage in Soho. It was quite the scene and a great meal filled with laughs. As you can see by the picture, we had a blast. By the end of it Katie, Mark, and I were ready for bed and we said our goodbyes as the birthday girls and company went on to continue the evening. And that was that, the birthday celebration we drove hours for was over, but worth it! how fun! it's so cool that you and katie are still so stinking close and that mark loves spending time with you 2. :) love that!! !